LEONARDO TURNS THREE YEARS OLD! Sunday, July 28 at 2:30 pm. Island Alpaca Leonardo has become a good-will ambassador for Island Alpaca and truly, for all alpaca. 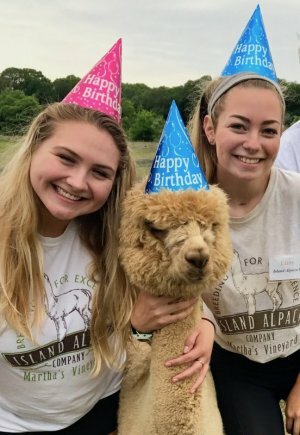 Come help us celebrate this much loved alpaca's 3-year birthday by joining us, Leo, and a number of Leo's pen-mates for ice cream cake from Dairy Queen and a festive hour with our special alpaca Leo! Photo opportunities abound, so bring your camera! Party hats provided! A wonderful experience for all ages. You will quickly learn why they are important to us and how sweet and gentle they are and how soft their fleece is! A fun farm experience for any alpaca lover. All ages welcomed! 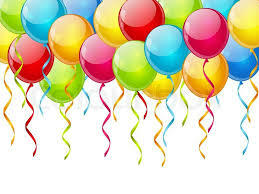 Party Time: 2:30 to 3:30 pm, Sunday, July 28, 2019. Rain or Shine! RSVP Pre-Registration: Cost is $5 per person. Payments may be made by telephone, online, or by check (payable to Island Alpaca Co.) or in person at the farm prior to program day, or by mail. Party size may be limited so RSVP early. SPECIAL NOTE: Online RSVP must be made 24 hours or more, in advance of party, as space may be limited to ensure a quality experience for all guests and alpaca alike. Walk-ins welcomed on a space-available basis. We hope you can join us for Leo's party!